1. Wash raw peanuts thoroughly in cool water; then soak in cool clean water for about 30 minutes before cooking. 2. Put peanuts in a pot and cover completely with water. Figure 1 cup of salt per gallon of water - or salt to taste. 3. The cooking period for boiled peanuts varies according to the maturity of the peanuts used and the variety of peanut. The cooking time for a "freshly pulled" or green peanut is shorter than for a peanut which has been stored for a time or a dried peanut. 4. 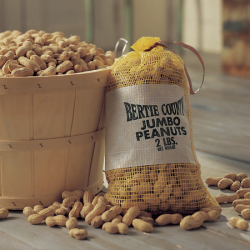 When fully cooked, the texture of the peanut should be similar to that of a cooked dry pea or bean. Boil the peanuts for about 4 hours, then taste. Taste again in 10 minutes, both for salt and texture. Keep cooking and tasting until they reach desired texture. For dried in-shell peanuts soak 8 hours in salted water, then boil 8 hours. Dried shelled peanuts can be cooked the same. 5. Drain peanuts after cooking or they will absorb salt and become oversalted. For extra salty tasting peanuts, soak overnight. Boiled peanuts are usually served as a snack, but they make a great substitute for dried cooked beans at any meal. They may be eaten hot, at room temperature, or chilled in the refrigerator and eaten cold, shelling as you eat. They will keep in the refrigerator for several days, or can be frozen for later.